Thinking Outside the box, fresh ideas and innovations inspire me. And I guess it inspires others too. As a photographer, I seek inspiration from the world around me, and also from the subjects I work on. And when the people whom I photograph come out with innovations themselves, then the inspiration has a greater effect. Recently, I found such an inspiration from a Wedding Mandap design used by Nishanth & Mythri – the couple whose wedding I photographed in Bangalore this year. In Bangalore and in larger parts of this country, the wedding events are generally held in indoor environments like a dedicated wedding hall or Kalyana Mantapa, auditoriums, concert halls, etc. In most of these venues, the set design follows a very traditional approach. Almost all the weddings events from the Wedding reception to wedding ceremonies are held on an elevated podium, dais or stage located at one extreme end of the hall. The guests would all be seated in rows facing the podium from the same direction. The wedding mandap for the wedding ceremony is erected or built on this dais. This June, I photographed a wedding in Bangalore at Sindhoor Convention Hall, located in JP Nagar (Bangalore South). My clients Nishanth & Mythri – the couple whose wedding it was – decided to bring in some fresh ideas to how their Wedding Mandap would be set up. They decided to completely ignore the podium/dais of the convention hall for the wedding ceremony. The podium was however used for their wedding reception. Instead of the podium, their wedding ceremony was held in the center of the hall at a location what would otherwise be the seating area. Their Wedding Mandap was setup up in the middle of the seating area, but on a slightly raised platform taking the action to a level little higher than the eye-level of the audience seated on chairs. The seating area was rearranged to have a circular pattern around the Wedding Mandap. This meant one could get a 360-degree field-of-view to the wedding ceremony if he/she moved around. In my opinion, this arrangement is aesthetic and is quite inspirational. It adds more symmetry to the huge seating area. The conventional rows & columns have become a little too predictable design. Great work Nishanth & Mythri! Cheers! I think that this arrangement also has one subtle plus point. It brings the guests to a social space that is closer or more intimate to the wedding ceremony space. In a traditional wedding seating arrangement described earlier, the guests seated in last rows would have found it hard to view the ceremony. I think it would make the last row guests a little disconnected with the events. Also, as a photographer, an interesting/helpful part of their Wedding Mandap design was that the ceiling of the Wedding Mandap was covered with a plain white fabric. This allowed me to bounce the light from my camera flash against the ceiling to create a nice blanket of soft light falling evenly around the couple. Since, it was white, it also meant that the reflected light added no color cast on their skin. I would highly recommend this “white-ceiling-design” to all the couples getting married. I hope to receive more such inspirations from my future clients. Since I was talking of inspiration from Nishanth & Mythri’s wedding, here is a gallery showcasing highlights from their wedding ceremony. Thank you for visiting my website. 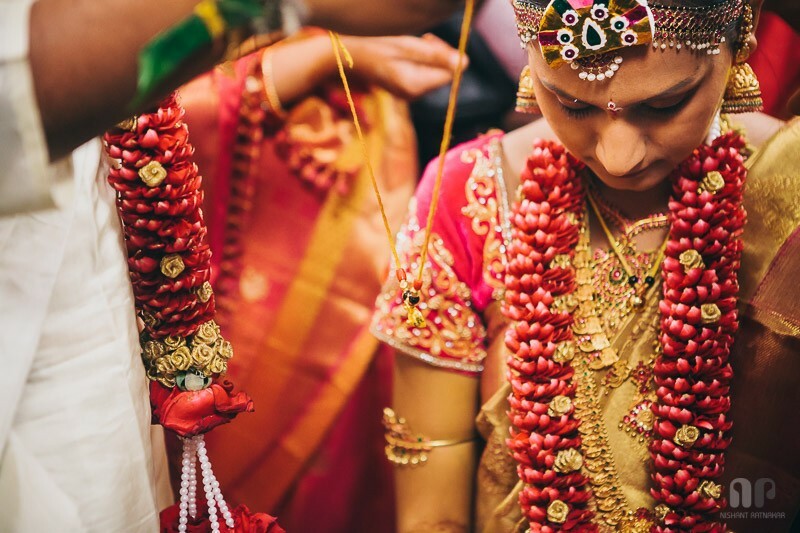 I am a Bangalore, India based Documentary Photographer specializing in Wedding, Portrait, and Editorial photography. I use this website to showcase my projects and also for sharing my knowledge on photography though my blog. Join me on Twitter, Google Plus or Facebook, or write to me via this Contact Form link for any assignments or for conversations on photography. This entry was posted in Weddings and tagged bangalore, candid wedding photographer bangalore, documentary wedding photographer, indian wedding photography, sindhoor convention centre, sindhoor convention hall, wedding decoration, wedding mandap design, wedding mandap ideas, wedding photographer bangalore.